As we near the end of our astrological year, many of us have been feeling tired, overwhelmed or even unwell. When the Sun travels through the final stages of Pisces, we are supposed to be winding down, letting go and preparing to start a new phase of development when our brightest star enters Aries on the 21st March. More about that next week. 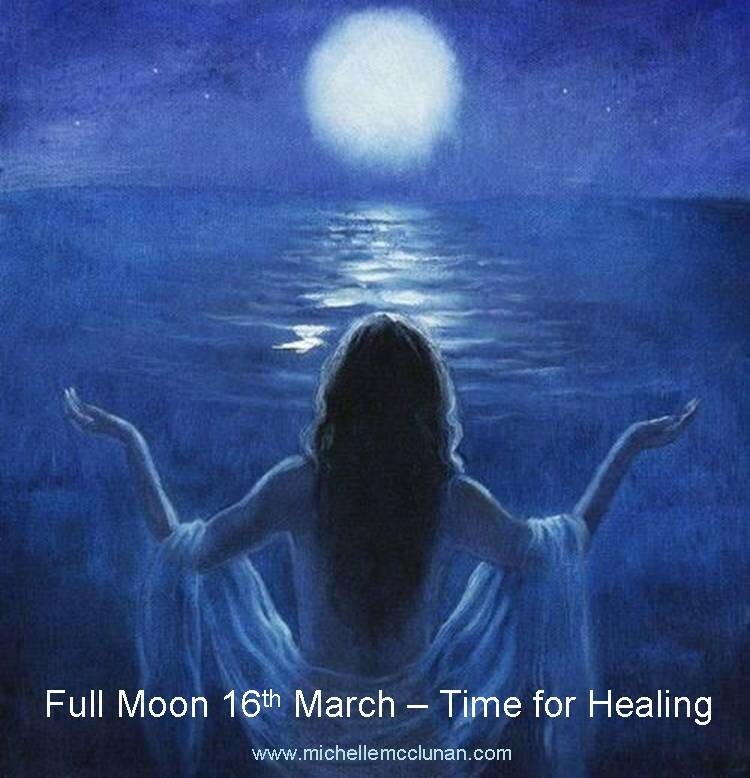 For now, we’re leading up to the last full moon of this astrological year, which happens on Sunday 16th March. The Moon will be in Virgo, opposite the Sun in Pisces. As I mentioned in my previous post, Pisces is all about tuning in and letting go. Virgo on the other hand is the purifier, analyst, strategist …the perfectionist. The Virgin governs, amongst other things, service to yourself and others, health, diet, fitness and the mind/body connection. This full moon gives us a really good opportunity to get to the bottom of what’s causing any physical, emotional or psychological imbalances. Allow the Pisces Sun energy to take you inside and the Virgo moon energy to discern what’s out of whack. Virgo is the expert at separating the wheat from the chaff, helping us to identify what we need to clear out and showing us what really serves us. We are a strange species, us human “doings” – Most other sentient beings will naturally do what they need to do, in order to make themselves feel better. However, so often with us, it takes getting sick or really feeling out of sorts, to wake us out of our slumber and start taking care of ourselves. Actually, we often do exactly the opposite of what serves us, which sabotages our happiness and our wellbeing. If that’s true for you, this is a good weekend to ask why? The Virgo full moon kicks off a week of real healing potential, so stop, re-connect, clear out and purge your body and life of anything that isn’t serving you. With Venus recently joining Mercury in Aquarius, there is also … wait for it… a “lightness of being” possible this weekend… yay!! Get out into the fresh air, connect with friends and have some fun. If we get our striving minds out of the way, brilliant innovative ideas ideas may very well be showered upon us too… bring em on, I say! Aquarius is also the sign that rules energy and humanitarian concerns. As energetic beings, when we heal ourselves, we raise our vibration and in so doing, help to elevate others and heal the planet. With Virgo being about service, ask yourself this full moon what you can do to contribute to the welfare of our precious planet, which continues to serve us every single day. The light of this powerful full moon will go a long way in helping us cope with the stress and chaos around us. It will also help us to feel more peaceful and harmonious, in preparation for the fiery month (and exciting astrological year) ahead. If you’d like to connect to your innate healing ability in a creative way, why not come along to a Wednesday Art & Soul class – first one is free.